Looking for some fast paced espionage action with James Bond-style gadgets, badder than bad evil genius villains trying to take over the world, secret spy codes, and lots of side-splitting humour? Of course you are, and Johnny Danger fits the bill perfectly. Join Jonathan Dangerfield on his second undercover mission as Johnny Danger. Of course, he’s more school boy than super spy, but that doesn’t stop him trekking through remote Amazonian jungles to find Dr Disastrous and thwart his evil plans to threaten the world with a Weapon of Gas Destruction. Following on from the first book in the series, Johnny Danger: DIY Spy, Johnny is joined by his best friend Tim and spy partner Penelope Pounds as he attempts to save the world. In addition to Dr Disastrous and his minions (Number 2A and Number 2B – the number 2’s), Johnny also has to deal with his annoying older brother Ian who is determined to blow his cover. Johnny Danger is a fun action hero who confronts his various challenges with more confidence than his limited espionage skills should allow. There is lots of gross humour to entertain younger readers, including references to number twos, bungee bogies, and more, and the plot moves along at a quick pace with a few twists and turns to keep readers turning pages. Kids will have fun decoding the chapter titles as well and enjoy the vague ramblings of The Blank Space. 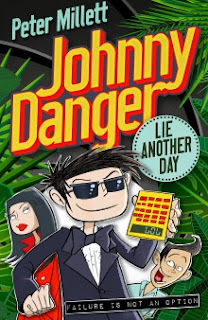 You can watch a fun book trailer for Johnny Danger: Lie Another Day to find out more and fans won’t have long to wait for the next book in the series, with the third book available later this year.